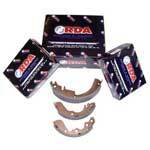 RDA's general purpose brake pad the - GP MAX - is a relatively full bodied semi-metallic compound pad. Made by the same manufactacturer as our RDA brake Discs, these pads are engineered for optimal performance. Shimmed, Chamfered and Centre Grooved to reduce brake vibration. 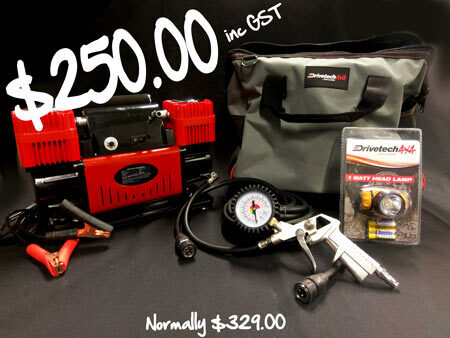 Cover 500 part numbers and includes a new warranty life of 18 month or 30,000km Warranty. Ideal for those with heavy cars who often carry large loads, 4WD's, people movers, fleet users, couriers, taxi's, towing trailers & those with a tendency to brake heavily in everyday driving. Semi Metallic Disc Brake Pads, Low dust, Extremely quiet, Exceptional pedal feel, High metallic compound, Baked enamel backing plate, Every pad is centre grooved, Every pad has chamfered edges. Every pad has a shimmed backing plate. A high friction pad designed for general replacement use on cars, vans and SUV's (4x4s). Using shimmed, chamfered and slotted technology and incorporating EBC's unique BRAKE-IN coating for super quick pad bed-in. EBC black coded brake pads are a high friction premium quality friction material approved to ECE R90 brake safety regulations and as such are an exact equivalent to original equipment pads fitted to your vehicle from the factory - but for far less money. Its universal heat range abilities and low rotor wear are additional benefits of the Ultimax pad range which is the EBC worldwide number one selling brake pad with numbers of sets sold running into tens of millions over the recent years. Unlike many of our performance grades Ultimax has remain unchanged as a pad compound for ten years now, a true testament to its success and customer acceptance. Why change a winning formula. Don't let the lower price point cloud your view of this superb quality product, these pads will stop your vehicle as fast as any original equipment pad and faster than most aftermarket pads. One brilliant feature of EBC R90 pads is their ability to completely eliminate brake judder and these pads will actually COMPENSATE for mild brake judder after 600-800 kilometres of use. Nominal friction co-efficient 0.46 with minimal rotor damage and similar dust to original parts. Disc wear is reduced by up to 50% with the EBC material compared to more abrasive semi metallic's. It is common to replace the rotor with every pad change on some OE parts but with EBC it is quite common to see one rotor last TWO sets of pad lifetimes, offering significant savings. This does NOT mean that the EBC pads wear quickly either. Designed for premium street driving offering better brake effect up to 600°C (1100°F). EBC Greenstuff has a high initial brake effect and gives drivers confidence from first application of the brake pedal. There is no such thing as a NO DUST pad. The very nature of how a brake works requires that some dust be generated to avoid rotor vibration (shimmying). The EBC pad creates less dust and dust is more easily washed off than most. All pads create more dust as they are bedding in especially if rotors are worn. For heavier faster cars and vehicles above 200bhp we strongly recommend Redstuff which DOES offer much less dust. The latest version of Greenstuff is a deliberately softer compound to improve pedal feel on lighter cars at lower speeds. This resulted in a medium dust material with good lifetime and minimal rotor wear. The UK MIRA Motor Vehicle Research Institute have shown a version of Greenstuff to stop a car almost 6mtrs quicker than original parts on a popular hot hatch braking from 100 KPH offering a huge 15% brake improvement. Greenstuff 6000 series is regarded as a first level brake improvement over stock and can deliver up to 15% improvement in stopping power. However Greenstuff 6000 is NOT a hard and long lasting pad and drivers may find Greenstuff last LESS MILES on light Trucks and SUV than stock units which in our opinion are designed primarily to pass the warranty period but 6000 are a good quality pad replacement with medium dusting and good brake effect. There are TWO reasons our customers love Redstuff, First because they are the lowest dust pad we have encountered by reducing dust by 60-90%. Plus the minimal dust you see is very easily removed with a simple sponge wash as it contains no steel fibre particles as in ALL OTHER pads. Second, they brake like an alligator right from cold (as good as Original pads or better) and just get better as they heat up. This material is a Kevlar fibre based brake compound enhanced with ceramic particles. If you have previously tried EBC Redstuff (pre-ceramic compound) this material is light years ahead. It lasts longer, it brakes better and is quieter. Being a hard wearing pad, bed-in times can be as long as 1,600 kilometres and drivers must be patient until the pad takes up the shape of their disc (brake rotor).This is a truly impressive fast road pad for repeated heavy braking. As EBC's flagship street brake pad material for prestige and faster cars above 200BHP the 09 version on EBC Redstuff sets new standards in brake performance. Redstuff has always been known for its low dust ability but the latest blend has greatly reduced the phenomenon of pad "Pick up" or disc scoring and reduced dust even further. 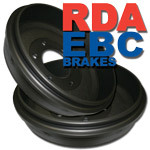 EBC Redstuff should be used at both front and rear for optimum balanced brake performance.